Indispensable. Key. Prized. These are just a few adjectives commonly used to describe the three commercially and ecologically important coral reef herbivorous (plant-eating) fish families – rabbitfish, parrotfish, and surgeonfish – targeted through Fish Forever campaigns. While not all herbivorous fish share the same life history, their extraordinary attributes can include growing rapidly and spawning daily (resulting in quick population recovery) – as well as providing high ecological, cultural and economic value. The habitats they maintain support all fish families, and they are indispensable to facilitating coral reef resilience, grazing algae to create space for coral settlement to grow. In many countries, they are key to the local economy, with fishers catching them out of necessity due to overfishing of ‘more desirable’ species. 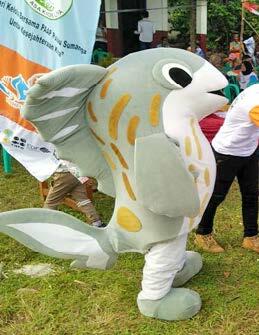 In others, they are a prized fish, e.g., rabbitfish are eaten in some Indonesian communities during important holidays. Given these benefits, any evident decline of herbivorous fish populations would threaten habitat health, household economy and food security, and local culture. Fortunately, results from Rare’s recent Fish Forever program impact report (2014-2017) coupled with Rare’s prior work on Marine Protected Areas show how recovery is possible. Fish Forever results indicate that biomass of targeted fisheries species was maintained or increased at 97% of sites both inside and outside reserves, and the mean change in biomass across these sites significantly increased over a seven-year period. Further analysis indicates that herbivorous fishes (rabbitfish, parrotfish and surgeonfish) are largely driving these changes. While the change in biomass of predatory fish families (snappers, groupers, and fusiliers) also significantly increased inside reserves, the magnitude of that increase was much greater in herbivorous fish (Figure 1). 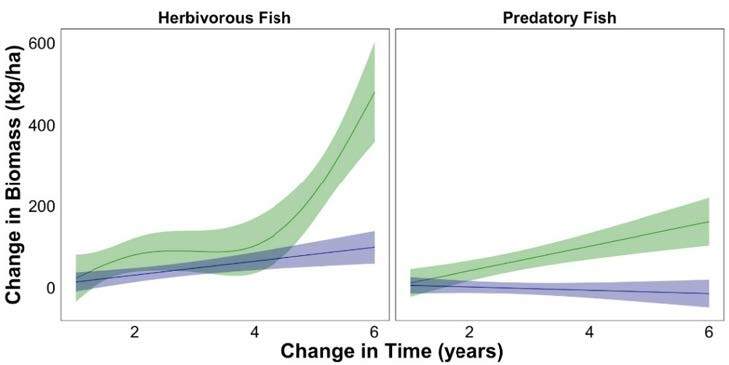 Figure 1: Change in herbivorous and predatory fish biomass over time since the first Rare campaign at 30 coral reef sites in the Philippines and Indonesia. Inside fully protected reserves (green) and outside reserves (blue). Solid lines are the mean across sites with variance as shaded area. Predatory fish biomass did not significantly change over time outside of the reserves. Data analyses on herbivorous fish are typically conducted to assess their role in an ecological context. However, Fish Forever also considers their benefits to fisheries. While the herbivore biomass increase was more substantial inside the reserves, targeted herbivorous fish biomass also increased outside the reserve – and this important distinction matters. Such increases inside the reserve provide primarily ecological benefits – improving reef health – whereas those outside provide both ecological and fisheries benefits. Thus, stable or increasing herbivore numbers inside and outside reserves indicates a positive response to fisheries management and multiple benefits to both people and nature. Fish Forever is exploring the drivers behind biomass increases to try to better understand which components of the Fish Forever intervention have been the most effective. This information will influence future site selection and program design, improving our ability to successfully facilitate herbivorous fish recovery. Women from the Fishermen’s Forum Posa’asa Kadie Liya—one of Wakatobi’s coastal fisheries management bodies established through Fish Forever – selling fish at the market. In coastal fishing communities around the world, women play critical roles in fishing activity. Despite their multiple contributions, however, they typically have an insufficient voice in fisheries management decision-making. Liya – a traditional fishing community comprised of five separate villages on the eastern coast of Indonesia’s Wakatobi National Park in Southeast Sulawesi – is shifting this norm. Fifteen women, three from each of the five villages, serve on Liya’s fisheries management body, based on their influence in the community and management expertise running three small businesses. As part of the body, they have provided their inputs and perspectives on coastal fisheries management and organized discussions around how resources like fish and seaweed will be managed, harvested and processed. Such participation is providing tangible benefits to management of the managed access area as well as helping to strengthen and/or create small businesses. Numerous enabling conditions have helped to pave the way for women’s inclusion. Firstly, the local fisheries office provides Liya women capacity development training to run small businesses. Using this expertise, the women have created successful businesses processing and selling skipjack fish floss, skipjack fish chips, and seaweed chips. Additionally, through Fish Forever, Liya’s fishers established a management body with the authority to create and manage a 700-hectare managed access with reserve area, and the foresight to evaluate it annually. This evaluation assessing management capacity gaps highlighted that women’s important roles in Liya’s fishing activity, primarily landing, selling and processing fish, and business acumen weren’t being recognized or leveraged. In response, the body – comprised mainly of traditional and religious leaders and male fishers – recruited the women to join as decision-makers. The Forum’s members cited that learning about women actively participating in management in other Fish Forever sites – e.g., as representatives on Pulau Seribu’s management body (in the Thousand Islands, north of Jakarta), and leading catch recording in Bunaken National Marine Park (off the coast of Northern Sulawesi) – served as inspiration for Liya women’s inclusion. While this is just one powerful example of the role Fish Forever has played in supporting participatory resource management, it is a critical example of how to value and integrate women’s important contributions to the small-scale fishing sector. As evidenced in the Fish Forever program impact report (2014-2017), establishing functional and/or legal management bodies, with representation from key stakeholders in the community, is a critical component of community-based fisheries management. While the Fishermen’s Forum had previously included women in consultative processes, they were not formally represented in the management body. Rare is also in the process of identifying ways to ensure that women’s contributions to financial inclusion, such as tracking household expenses and savings, are captured. For example, one of Liya’s female business owners initiated a savings club in her village in 2006, and to date, manages 48 members with almost $8,000 of savings. The female Fisher’s Forum representatives are now pushing to replicate this model in other villages. Rare will continue supporting Liya and other fishing communities in adopting strategies that address gender inequalities and social change impacts and ensure equitable benefits from coastal fishing activities for men and women. Female fish buyers in the Fequete community of Mozambique’s Inhassoro District learn about OurFish. 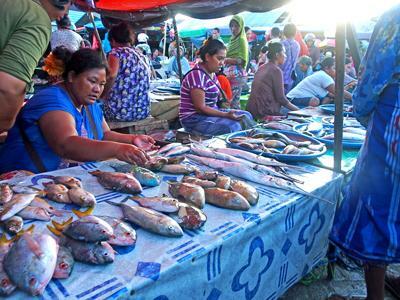 Coastal fishers and buyers in Mozambique have joined over 10,000 fishers and buyers in Belize, Honduras, Brazil and Myanmar who have begun registering and recording their fishing transactions through the digital fisheries data collection platform OurFish. The 205 coastal fishers and 30 buyers in Mozambique’s Fequete coastal community, in the south-east Inhassoro District, are the country’s first fishing community to adopt the new platform. Over the course of two days on the beach, during periods of fishing downtime and heavy rain, Fish Forever local leader Anuar Amade and Rare technical staff customized the app to the fishing community—working alongside the primarily female fish buyers to record and photograph the community’s most commonly caught species (to produce relevant icons in the app) and guide them in practicing how to record the day’s catch. Meanwhile, Anuar registered each fisher in the app using RARE’s new mobile registration system (as reported in Issue #11, the one-minute registration process is necessary for fishers to be able to connect to OurFish and access the many benefits). What made OurFish’s first test in Fequete unique was the context of the cooperative fishing gear used: Fequete’s fishers use beach seines (traditionally, this gear use generates communal, instead of individualized, catch and price), and buyers purchase fish based on fish size in the communal pot, regardless of species type. OurFish thus created an impetus for buyers to separate and record the catch by species, which is critical (and historically unrecorded) information for identifying species-specific catch levels over time. This relatively immediate change in buyer behavior is an important preliminary example of the potential for OurFish to easily collect data necessary for fisheries protection and management decision making. In addition, fishers stated that registration made them “feel more like fishers.” Such a profound statement illuminates the potential benefits of not only recording catch but professionalizing a sector traditionally recognized as informal. 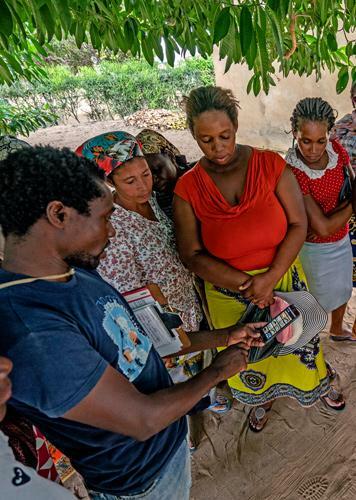 With the app now configured for use in at least one Mozambican fishing community, Rare is moving forward, with support from the Swedish Postcode Foundation, in registering over 500 fishers in Fish Forever Mozambique’s six target coastal fishing communities, and partnering with at least 50 buyers – and, ultimately, learning what’s needed to effectively collect, record and utilize coastal fishing data in the Mozambican context. Plans to launch OurFish in Palau, Indonesia, the Philippines, and Mexico are forthcoming. The USAID/Sustainable Ecosystems Advanced (SEA) Project, together with the Raja Ampat District and Maya Tribe Adat (i.e., Customary) Council, recently celebrated the launch of Indonesia’s second customary law Managed Access with Reserves network. (Read about the first network established in Mayalibit Bay). Kristian Thebu, Head of the Council, and Raja Ampat District government partners have been instrumental in empowering Raja Ampat’s fishing communities to craft new marine tenurial agreements. Mayalibit Bay’s success has served as a role model for designing this second, and larger, customary law network in the Dampier Strait (in Raja Ampat District, West Papua Province). Successful implementation of customary law Managed Access with Reserves (MA+R) networks in West Papua Province. The formal agreement, signed by 58 local leaders representing 15 villages in the Dampier Strait, has established 21 Managed Access and Reserve areas with over 200,000 hectares of inshore marine waters. The agreement includes a range of new fisheries harvest-control regulations to counter the challenges that have faced the Dampier Strait Marine Protected Area (MPA) (viewed by many as the ‘gateway’ to Raja Ampat from the capital city, Sorong). While traditional practices have long been permitted by Dampier Strait MPA’s zoning restrictions, Sorong-based fishing fleets – often using a variety of ‘non-traditional’ boats and gears – have regularly encroached on MPA territory, causing challenges for local enforcement. Using the new network’s map, which delineates boundaries and fishing regulations, fishing communities are more empowered to surveil and enforce the regulations and capture fair value of their catch. Rare, as a member of the USAID/SEA Project consortium, anticipates the Adat Council’s official declaration of the network over the next few months and the district government’s official decree within the year. Ultimately, Rare will work with government partners to codify the new network within West Papua’s provincial marine spatial plan. The USAID/SEA Project is a five-year initiative (2016-2021) to support marine conservation and improved fisheries management in Indonesia and is supported by USAID/Indonesia. By request, Rare staff in Brazil recently trained the Brazilian National Environmental Agency (ICMBio) technical staff on using the Adaptive Fisheries Assessment and Management (AFAM) Toolkit created by the University of California Santa Barbara-Sustainable Fisheries Group. Rare staff used AFAM’s tools to analyze and interpret years of catch monitoring data collected by ICMBio, and together with the agency’s staff, delivered a joint presentation at ICMBio’s headquarters to share and showcase results to a broader audience of Marine Protected Area managers and Marine Extractive Reserves (RESEX) leaders, traditional coastal communities, and artisanal fisher representatives. Over the past few months, Rare Brazil has been working closely with ICMBio on designing a participatory fisheries monitoring program for Brazil’s protected areas. Alexander Tilley, Pilar Herrón, Silvana Espinosa, Juliana López Angarita, and Stephen Box. Marine Policy 94.
by providing a rapid characterization of community vulnerability to management decision-making in a range of management intervention options. Tobert S. Steneck, Peter J. Mumby, Chancey MacDonald, Douglas B. Rasher, and George Stoyle. Science Advance 4 (5). The authors studied 12 islands along the 700-km eastern Caribbean archipelago, comparing fished and unfished coral reefs. This study illustrates the value of managing fish stocks for the process of herbivory as an indirect driver of coral recruitment and thus the resilience of coral reef ecosystems. Local management improves coral reef’s capacity to recover from disturbances, but the signal attenuates unless properly measured. Local fisheries management resulted in a 62% increase in the archipelago’s juvenile coral density, improving the ecosystem’s recovery potential from major disturbances. Kimani A. Kitson-Walters, Adam S. Candy, Nathan K. Truelove, Marcia E. Roye, Mona K. Webber, Karl A. Aiken, and Stephen J. Box. Fisheries Research 199. The authors analyze the fine-scale population structure of Lobatus gigas populations in Jamaica. The island’s primary conch fishing ground, located offshore on Pedro Bank, receives limited gene flow from the other sampled populations and may be heavily dependent on local recruitment or receive recruits from sources external to Jamaica. If the question of recruitment on Pedro Bank is not addressed, eventual population exhaustion is inevitable. Rafael Almeida Magris, Marco Andrello, Robert Leslie Pressey, David Mouillot, Alicia Dalongeville, Martin Nilsson Jacobi, and Stéphanie Manel. Conservation Letters. The authors link prioritization methods with population models to explore the impact of integrating both representation and connectivity into conservation planning for species persistence. They show that: (1) considering both representation and connectivity objectives provides the best strategy for enhanced biodiversity persistence; and (2) connectivity objectives were fundamental to enhancing persistence of small-ranged species, which are most in need of conservation.